Residents staying at the corner of Klip – and Von Brandis Street set the bar high as they are continuing to show us all what a clean and well maintained living space looks like. 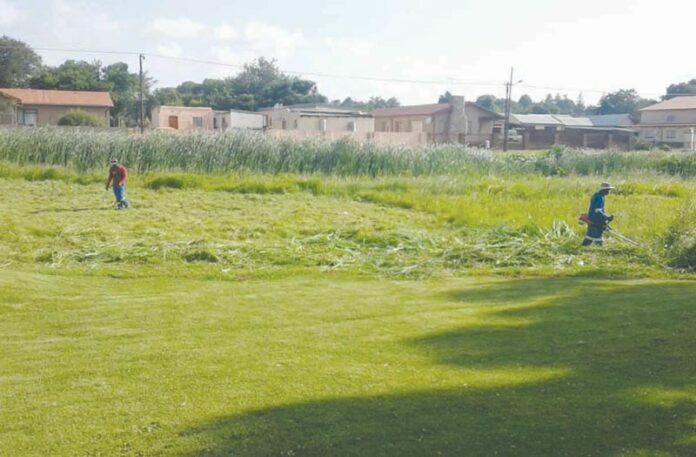 On numerous occasions, they are seen busy cleaning the field and cutting the grass. Should we all not take note of this and keep our own living areas neat and tidy? Why should one revert to shifting the blame? By picking up rubbish on your pavement or cutting the grass in the field opposite your property will certainly not kill you. It is often easy to say “but it is not my job” and “look at this mess”. People get angry when they see piles of rubbish in a field or overgrown vegetation in an empty yard which creates the perfect hiding place for criminals – the question is, are you actually doing your part before you start complaining? What will become of our beautiful earth if we don’t take care of it? Yes, there are people being paid to get the job done, but are you willing to set the example for others to follow? Or are you the one walking past rubbish on a sidewalk and turning a blind eye or do you bend down and pick it up? When you drive (or walk) in residential areas where people take the initiative to clean and maintain areas around their property, it makes one proud and leaves you with a positive mindset where you also would like to make a difference – that is what setting an example means. Do your part in our society and you will see that it will cause a positive ripple effect. It all starts with a small step in the right direction. Previous articleWell done Xolani Hadebe!